Have you been enjoying the knitting series by Rebecca Danger? Rebecca Danger (blog found here) is such a clever knitting pattern designer and has a fantastic collection of knitting. Just check out some of her patterns that she has available (plus tons more) in her shop, here. Adorable, adorable, and more adorable. Wow. Rebecca also recently came out with a knitting book, packed with knitted monster patterns……. There are 20 brand new patterns, complete with all you need to know to create her sweet little monsters. What I love about Rebecca’s monsters, is that each monster has a name and a personality. She gives descriptions of each of her little monsters……which are so fun to read. 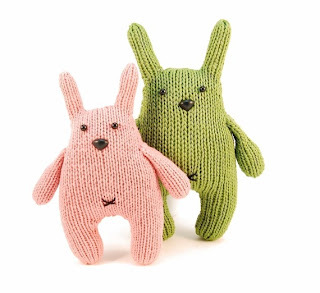 And since we’ve all been taught the basics, it’s time to put those knitting lessons to practice and refine our stitches and become better at reading patterns (and use the tips from the post earlier today)……….and then knit some of these little monsters. Hooray. And good news…….Rebecca is giving away one of her Knitted Monsters pattern books to one of you Make It and Love It readers. Wouldn’t you like to add to your knitting book collection? Or start one? Or give it to a friend/mom/sister who loves to knit? Blog, Facebook, or Tweet about this giveaway, and then tell me you did, each with a separate comment. Giveaway will close Monday, April 18th, at 11:59 p.m., EST. The momma & baby? Adorable!!! How cute! 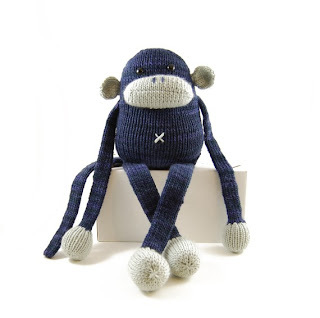 I would love this book to learn how to knit :) I love the Jerry the Musical Monkey, very cute! Thank you! I like the momma and baby monster candy cane striped toy. I love Sammie the Sock Monster! I'm really excited about this whole thing – I am really in to knitting and excited to be learning new things about it! Yay! I've been drooling over her book for some time now! My fave is Penelope and I'd love to knit Robbie for my little boy. :) Thanks for the giveaway! This book may be my inspiration to learn to knit!! I LOVE the robots. Doing our son's room in robots and these would be perfect!! Love the momma and baby. Have sisters who are wanting to knit so it'd be a great gift! They're all great, but I love Greta the Captivating Cat. Thanks for the chance to win! My favorite is definitely Tofu the Dachshund, so cute and looks like my sister's little dog. I just made Frances the Charismatic Monster, and I am absolutely in love with it so that would have to be my favorite. I've got my eye on that monkey pattern though; it is adorable. I love Jerry the Musical Monkey! I'm so sad that the series is over. Thanks for hosting it! Got to love Sammie the sock monster! ambs101 [at] hotmail [dot] com. It's so hard to decide. I like Jerry the musical monkey, Sammy the sock monkey, and Zeke the aloof Alpaca. So cute! I love the monkeys! They are so cute! I absolutely love Daphne and Delilah the Momma and Baby Monster … I'm gonna buy it if i don't win. Just put the giveaway on my facebook page. I hope I win. I love Francis the Charismatic Monster! The others are so cute, but I just keep coming back to him! Daphne and Delilah the Momma and Baby Monster are my favorite. I am just learning to knit and would love to have something fun to make. I love Wasabi the pug! My favorite is Jerry the Musical Monkey–I've made one of Rebecca's patterns before, and not only are they cute, but they're incredibly well written. I'd love to have this book to make little monsters for all of my friends!! Too many to choose from! Jerry the musical monkey is one of my favorites! i love the monkey, but I have to say the alpaca is dang cute!! Daphne and Delilah is soo cute! Love knitted monsters…I always visualized using my ends to make random mutt-ly monsters to give away to my friends. I love the ones with crazy horns and ears the best. I am in love with Maddox the Mischievous Monster. I don't know how to knit, but I'd LOVE to learn!!! shared on facebook….love the book, love the blog. I LOVE Penelope The Empathetic Monster!!! She is so cute! I'm new to knitting (self taught…woooot internet!) and would love to knit monsters! So fun. my mom is a fantastic knitter and I'd love to give this to her for Mom's day. She's always knitting adorable sweaters and booties for the grandbabies. I think my favorite patterns are the greta the cat and the elephant ones. So cute! I just LOVE Robbie the Radiant Robot! I just left her shop and you want me to pick my fav???? hmmm thats hard… I really like Jerry the monkey. ooooo nut the pug is super cute too and I love the robots… see I cant just choose one!!! I love Irving the Icebox Monster…I especially love the name! love the jerry the monkey pattern! I like Daphne and Penelope. I love the alpacas, but everything is so cute. 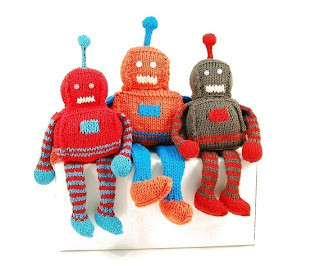 I've been begging my knitting friend to make one of these adorable monsters for my adorable monster, so if I could give her the book, there would be no more excuses! haha!! I adore Frances the charismatic monkey and Olivia the audacious monster. Frances The Charismatic Monster Knitting Pattern is my favorite, but all of her monsters are amazing! posted about it on my FB wall!! Ahhhh! My sons 1st b-day party is going to be monster themed, I would love, love, love to make some for him as a gift and even a few small ones for his little buddies! I sew but have been aching to give knitting a try, her book would be an amazing help! I love the robots and probably every one of the monsters! Especially the mom and baby monster pair! Penelope is so adorable….loved this series and looking forward to making her! Thank you! The robots are so cute! I posted the give away on my facebook! I love the Jerry the musical monkey. But really, I love them all! I posted you blog to my facebook wall !!! Jerry the musical monkey is perfect for my little girl she has loved monkeys since I can remember. My grandma tried to teach me to knit 100 times and know I finally found something I would really love to make. Thanks for the series! I really love Jerry the musical monkey!! My grandson would eat it up! Not literally, but some major slobber!!!!! I like Jerry the musical monkey. So cute. I love Daphne and Delilah! The elephants, hands down. They are my favorite animal but I also think the narwhal is super cute. opps, my comment was the elephants and the narwhal but I forgot my email. I also did a (BLOG POST) about your give away!!! It's so cute! I am just learning how to crochet, i would love love love a book to learn to make cute little monsters ! I have so far made a pot holder and two scarfs! One for me and one for my friend! If I won the giveaway I would give this cute book to my mother in law who knits, so she can make the grandkids these cute little animal/monsters. I haven't yet found the time or dedication to sit down and learn to knit, but someday I will!! I gotta go with Jerry, the Musical Monkey. Too cute. I also made a comment on the make it love it facebook page !!!!! I love the Robbie the Radiant Robot and Olivia the Audacious Monster patterns the best!! They are so cute and adorable! I posted it on facebook, too! These little monsters are so cute. I want to make all of them for my grandaughter. 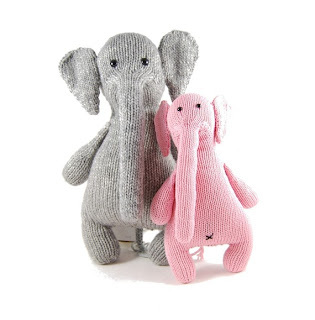 I LOVE "Esther the Elephant"!!! She is so ADORBS!! I know my daughter would LOVE her too!! What an AWESOME book!! I just commented about it on Facebook. I'm sure my friends will love this. I blogged about the giveaway…and my current knitting project! Oh my goodness, I LOVE all of the Jerry Monkeys (my son is a monkey boy) but I just found out this morning that I'm pregnant, and I hope it's a girl so I can make her a Penelope monster! SO cute! I love the Daphne and Delilah monsters the best because of the pocket…but overall it was a very very hard decision to make. I love them all! Penelope. Love her. Want to make her!!! !